Cushing’s Conventions have always been special times for me – we learn a lot, get to meet other Cushies, even get referrals to endos! As early as 2001 (or before) my pituitary function was dropping. My former endo tested annually but did nothing to help me with the symptoms. In the fall of 2002 my endo refused to discuss my fatigue or anything at all with me until I lost 10 pounds. He said I wasn’t worth treating in my overweight condition and that I was setting myself up for a heart attack. He gave me 3 months to lose this weight. Those 3 months included Thanksgiving, Christmas and New Years. Needless to say, I left his office in tears, again. Fast forward 2 years to 2004. I had tried for a while to get my records from this endo. He wouldn’t send them, even at doctors’ or my requests. I wanted to go see Dr. Vance at UVa but I had no records so she wouldn’t see me until I could get them. Finally, my husband went to the former endo’s office and threatened him with a court order. The office manager managed to come up with about 13 pages of records. For going to him from 1986 to 2001 including weeks and weeks at NIH and pituitary surgery, that didn’t seem like enough records to me. 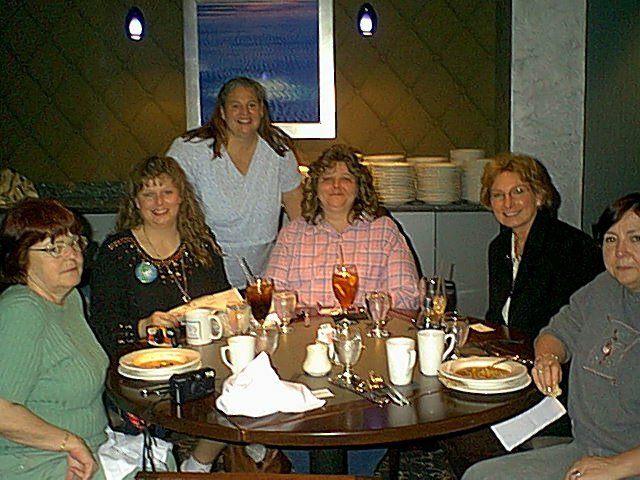 In April of 2004, many of us from the message boards went to the UVa Pituitary Days Convention. That’s where the picture above comes in. Other pictures from that convention are here. By chance, we met a wonderful woman named Barbara Craven. She sat at our table for lunch on the last day and after we learned that she was a dietitian who had had Cushing’s, one of us jokingly asked her if she’d do a guest chat for us. I didn’t follow through on this until she emailed me later. In the email, she asked how I was doing. Usually, I say “fine” or “ok” but for some reason, I told her exactly how awful I was feeling. Barbara emailed me back and said I should see a doctor at Johns Hopkins. I said I didn’t think I could get a recommendation to there, so SHE referred me. The doctor got right back to me, set up an appointment. Between his vacation and mine, that first appointment turned out to be Tuesday, Sept 14, 2004. Just getting through the maze at Johns Hopkins was amazing. They have the whole system down to a science, moving from one place to another to sign in, then go here, then window 6, then… But it was very efficient. My new doctor was wonderful. Understanding, knowledgeable. He never once said that I was “too fat” or “depressed” or that all this was my own fault. I feel so validated, finally. He looked through my records, especially at my 2 previous Insulin Tolerance Tests (ITT). From those, he determined that my growth hormone has been low since at least August 2001 and I’ve been adrenal insufficient since at least Fall, 1999 – possibly as much as 17 years! I was amazed to hear all this and astounded that my former endo not only didn’t tell me any of this, he did nothing. He had known both of these things – they were in the past records that I took with me. Perhaps that was why he had been so reluctant to share copies of those records. He had given me Cortef in the fall of 1999 to take just in case I had “stress” and that was it. The new endo took a lot of blood (no urine!) for cortisol and thyroid stuff. I went back on Sept. 28, 2004 for arginine, cortrosyn and IGF testing. He said that I would end up on daily cortisone – a “sprinkling” – and some form of GH, based on the testing the 28th. For those who are interested, my new endo is Roberto Salvatori, M.D. Research Interests: Control of growth hormone secretion, genetic causes of growth hormone deficiency, consequences of growth hormone deficiency. Although I have this wonderful doctor, a specialist in growth hormone deficiency at Johns Hopkins, in November 2004, my insurance company saw fit to over-ride his opinions and his test results based on my past pharmaceutical history! Hello??? How could I have a history of taking GH when I’ve never taken it before? Of course, I found out late on a Friday afternoon. By then it was too late to call my case worker at the drug company, so we had to appeal on Monday. My local insurance person also worked on an appeal, but the whole thing was just another long ordeal of finding paperwork, calling people, FedExing stuff, too much work when I just wanted to start feeling better by Thanksgiving. As it turned out the insurance company rejected the brand of hGH that was prescribed for me. They gave me the ok for a growth hormone was just FDA-approved for adults on 11/4/04. The day this medication was approved for adults was the day after my insurance said that’s what is preferred for me. In the past, this form of hGH was only approved for children with height issues. Was I going to be a guinea pig again? The new GH company assigned a rep for me, submitted info to the pharmacy, and waited for insurance approval, again. I finally started the Growth Hormone December 7, 2004. Was the hassle and 3 year wait worth it? Stay tuned for April 24, 2018, when all will be revealed. Quick answer: NO!